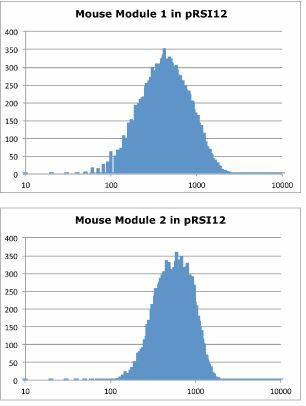 Mouse DECIPHER shRNA libraries are pooled, barcoded, lentiviral shRNA libraries optimized for RNAi Genetic Screens in pooled format. They target approximately 10,000 mouse genes. The DECIPHER RNAi screening platform was an open source project from 2010-2014, created by Cellecta to provide tools for researchers to perform and analyze comprehensive shRNA knockdown screens and to develop a standardized, yet versatile platform for collecting and comparing results from different studies and labs. DECIPHER Project members have published numerous peer-reviewed papers. More information and resources are available on the DECIPHER Project website. The histograms above show the distribution of shRNA/barcode sequences in the DECIPHER plasmid shRNA libraries. Virtually all of the shRNA are present in more than 100 copies and most are around 1,000 copies per 20 million HT sequencing “reads”. Also, there is less than a 10-fold difference between the most and least represented sequences for about 90% of the shRNAs, an indication that the libraries have a balanced representation of all shRNAs. NOTE: Cellecta offers academic discounts on many of our plasmid and pre-packaged libraries to qualifying academic institutions. Please email orders@cellecta.com from your institutional email account to request a quote with the discounted pricing. Email sales@cellecta.com for additional information. Product Analysis Certificates are provided as PDF files and are available for download on the Product Manuals and Certificates page in the Resources section. Cellecta performed an RNAi screen with a DECIPHER library to identify prostate cancer-specific gene targets with therapeutic potential in prostate neoplasia treatment. A viability screen was performed on a set of model prostate carcinoma cell lines. Click here for the screening data. Gao M, Monian P, Pan Q, Zhang W, Xiang J, Jiang X. Ferroptosis is an autophagic cell death process. Cell Res. 2016 Aug 12. doi: 10.1038/cr.2016.95. [Epub ahead of print] PubMed PMID: 27514700. Li Q, Karim AF, Ding X, Das B, Dobrowolski C, Gibson RM, Quiñones-Mateu ME, Karn J, Rojas RE. Novel high throughput pooled shRNA screening identifies NQO1 as a potential drug target for host directed therapy for tuberculosis. Sci Rep. 2016 Jun 14;6:27566. doi: 10.1038/srep27566. PubMed PMID: 27297123; PubMed Central PMCID: PMC4906352. Yeddula N, Xia Y, Ke E, Beumer J, Verma IM. Screening for tumor suppressors: Loss of ephrin receptor A2 cooperates with oncogenic KRas in promoting lung adenocarcinoma. Proc Natl Acad Sci U S A. 2015 Nov 5. pii: 201520110. [Epub ahead of print] PubMed PMID: 26542681. Guo J, Liu H, Zheng J. SynLethDB: synthetic lethality database toward discovery of selective and sensitive anticancer drug targets. Nucleic Acids Res. 2015 Oct 29. pii: gkv1108. [Epub ahead of print] PubMed PMID: 26516187. Weige CC, Birtwistle MR, Mallick H, Yi N, Berrong Z, Cloessner E, Duff K, Tidwell J, Clendenning M, Wilkerson B, Farrell C, Bunz F, Ji H, Shtutman M, Creek KE, Banister CE, Buckhaults PJ. Transcriptomes and shRNA suppressors in a TP53 allele-specific model of early-onset colon cancer in African Americans. Mol Cancer Res. 2014 Jul;12(7):1029-41. doi: 10.1158/1541-7786.MCR-13-0286-T. Epub 2014 Apr 17. PubMed PMID: 24743655; PubMed Central PMCID: PMC4101030. Wolf J, Muller-Decker K, Flechtenmacher C, Zhang F, Shahmoradgoli M, Mills GB, Hoheisel JD, Boettcher M. (2013) “An in vivo RNAi screen identifies SALL1 as a tumor suppressor in human breast cancer with a role in CDH1 regulation.Oncogene. Advance online publication 2 December 2013; doi: 10.1038/onc.2013.515. Wolf J, Dewi D, Fredebohm JA, Muller-Decker K, Flechtenmacher CA, Hoheisel J, Boettcher, M. (2013) “A mammosphere formation RNAi screen reveals that ATG4A promotes a breast cancer stem-like phenotype. Breast Cancer Research. 15:R109 doi:10.1186/bcr3576. Fredebohm J, Wolf J, Hoheisel JD, Boettcher M. (2013) Depletion of RAD17 sensitizes pancreatic cancer cells to gemcitabine. J Cell Sci. Aug 1;126(Pt 15):3380-9. doi: 10.1242/jcs.124768. Epub 2013 May 17. PubMed PMID: 23687379. Cellecta DECIPHER shRNA libraries are provided with a complete protocol and all sequencing information to enable researchers to perform high throughput genetics screens and analysis. However, we do also provide Next-Gen Sequencing (NGS) and analysis services for researchers running their own screens with our libraries. Just provide harvested cells for each time point or treatment condition (one sample), and we extract DNA, amplify, sequence, and assemble the data with some basic analysis. Please see the Next-Gen Sequencing and Analysis web page for additional information and how to order.